Earlier today Apple received patent number 8,610,726 titled “Computer systems and methods with projected display”. 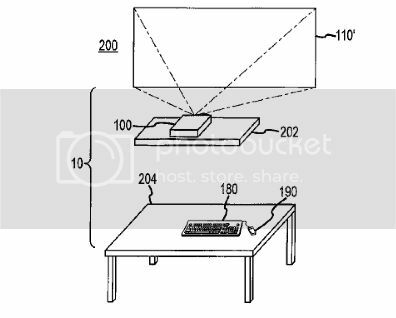 This patent covers technologies that can allow consumers to have a computer experience that does not involve wires, and takes up significantly less desk space. This computer is equipped with a laser projector, but is more than just a projector. Unlike other modern projectors, this computer is equipped with a technology that allows raw image data to be read without any rasterization (could this mean vector based media not too far in the future?). In addition to the technologies that can improve image quality, Apple’s computer also is able to adjust itself automatically at various angles and distances. This is possible by many different sensors found on the computer, such as an accelerometer, ambient light sensor, and depth sensor. These technologies allow the user to display a image that is up to 40” on many surfaces, without having to manually fiddle with the device itself. This computer is not only a big step for the development of displays, but it also provides a unique wireless computer experience. There are almost no external wires involved at all with this computer. Peripherals, such as the mouse and keyboard, are connected wirelessly. In addition to wireless peripherals, Apple also included a inductive charging pad on the computer, allowing the computer to charge and/or be powered without any wires or power bricks. Personally I am excited to see something like this finally show up. This seems like it can really improve the portability of computers. Not only will this allow a tidy set up in a home, but this could be extremely beneficial to those who constantly need to bring a computer to work and work with presentations. It should be noted that this was filed for in 2008, so Apple has had this idea for quite some time. Also note there is no confirmation that Apple is or isn’t working on this right now, they simply have the proper patent.